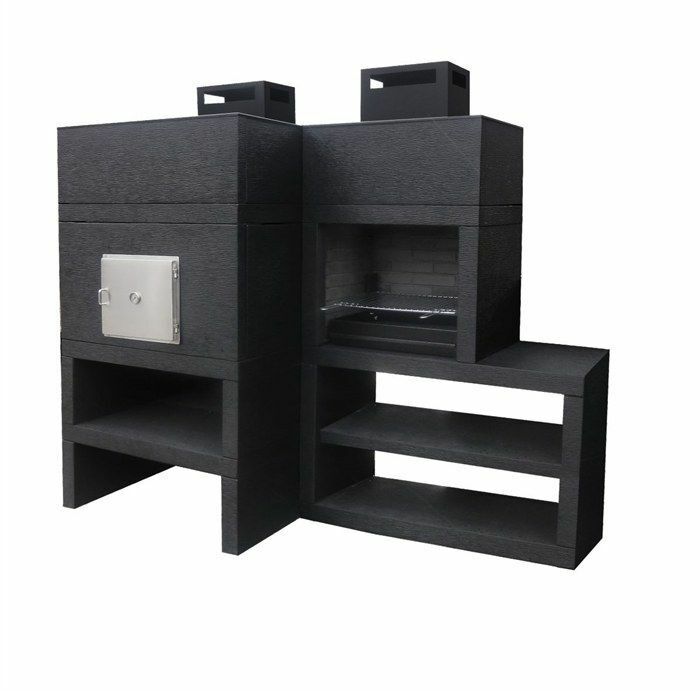 Modern Barbecue with Oven AV85M. Free shipping to England, Holland, Germany, metropolitan France*, Monaco, Belgium, Luxembourg, Italy and Spain. For other destinations please contact us. These grilled chicken tostadas are topped with rich mole sauce and sweet-and-sour summer vegetables and use store-bought tostada shells for convenience. Combine chili powder, lime juice, oil, cumin, onion powder, garlic power, salt and pepper in a small bowl. Rub 2 tablespoons of adobo rub generously all over chicken breasts (the remaining rub can be stored in the refrigerator for up to 3 days). Let marinate for 30 minutes or wrap in plastic and refrigerate for up to 1 day. Tear chiles into pieces; discard stems and seeds. Place in a bowl, add boiling water and soak until the chiles are soft, about 30 minutes. Pour the chiles and soaking liquid into a blender. Add tomatoes, onion, garlic, vinegar, flour, sugar,cumin, pepper, cayenne to taste and cloves; blend until smooth. Strain the sauce through a sieve to filter out any remaining seeds and skins, pressing out as much liquid as possible from the solids. Heat oil in a large skillet. Bring 2 cups water to a boil in a large saucepan. Add carrots and cook for 7 minutes. Add squash, vinegar, oregano, 1 teaspoon sugar, ½ teaspoon pepper and ¼ teaspoon salt. Continue cooking until the vegetables are just tender, 2 to 3 minutes more. Drain, transfer to a bowland season with more pepper to taste. Set aside to cool. 4. About 20 minutes before you’re ready to grill the chicken, preheat grill to medium. Place 2 tostada shells on each plate. Drizzle about 2 table spoons of the mole sauce over each tostada, then top each with about 2 ½ tablespoons of the vegetables. Divide the chicken among the tostadas and drizzle with more mole sauce. Serve with taco garnishes as desired.